On a recent trip to mountainous Southern Greenland, we took a small fishing boat into the fjord to capture giant icebergs. On this particular morning, the fjord was completely still. 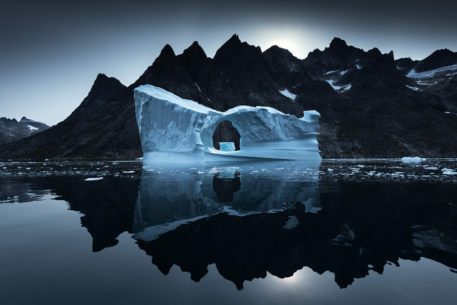 This iceberg had an enormous arch in it, and a backdrop of peaks thousands of feet tall. It was an incredible sight to see!